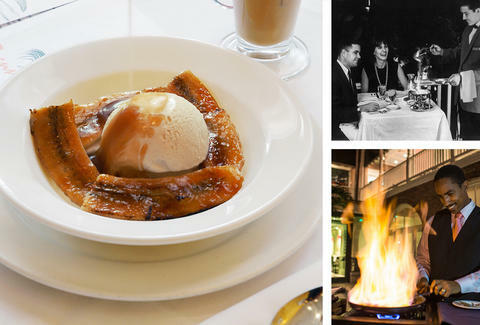 A staple at the French Quarter’s legendary Brennan’s restaurant since 1951, bananas Foster is New Orleans in dessert form: bananas, butter, brown sugar, cinnamon, vanilla ice cream, and rum, set afire for both taste and spectacle, served for breakfast because why the hell not. With a gracious assist from current Brennan’s proprietor Ralph Brennan, we dug into the history of this classic destroyer of diets. The dessert was named for Richard Foster, a friend of Brennan’s founder Owen Brennan, on the occasion of a dinner in honor of his work as chairman of the New Orleans Crime Commission. The Commission was supposed to cleanse the French Quarter of vices; fortunately, gluttony was left off the list. Robert Wolke’s cookbook, What Einstein Kept Under His Hat: Secrets of Science in the Kitchen, contains a recipe for bananas Byczewski, a variant named for Flawiusz Byczewski -- another friend of Owen Brennan’s, reputed to have committed suicide after Brennan passed him over for naming rights to the dessert. As Wolke attests, this almost certainly didn’t happen, but the story’s nonetheless a pretty good excuse to tinker with perfection. 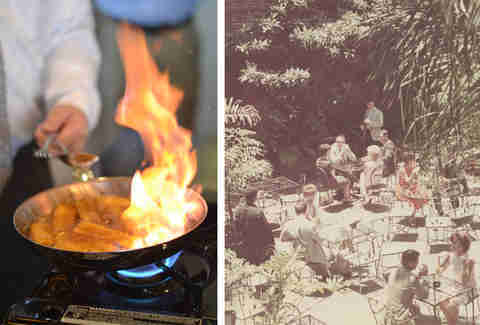 Well, he wasn’t a ghost at the time, but apparently the spirit of the restaurant’s first chef, Paul Blangé -- who along with Ella Brennan ushered bananas Foster into existence -- does still rattle about the kitchen. It’s not because he’s starved for attention: current executive chef Slade Rushing keeps a picture of Blangé displayed for inspiration. And when Brennan’s held a grand reopening around 18 months ago, Blangé’s great granddaughter came to represent the family. That ghost went out in style! Blangé, who cooked for several presidents at the White House, passed away in 1977. When he was buried, placed across his chest were a fork, a knife, and a Brennan’s menu. 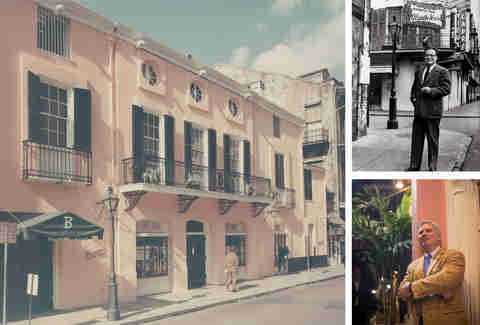 Frances Parkinson Keyes wrote over 50 novels in her lifetime, but one, the 1948 murder mystery Dinner at Antoine’s, had an indirect but profound affect on New Orleans dining. The book did such wonders for Antoine's business, Owen Brennan decided to promote “Breakfast at Brennan’s” -- a still-happening three-course feast that starts with an “eye opener” (say, Brandy Milk Punch), cruises through three wine-friendly courses (such as eggs Hussarde, another Blangé creation), and finishes with, you guessed it, flaming, rum-soaked bananas. Sunday “brunch,” which starts at the courageous hour of 8am, sees around 500 covers, and around 350 of those order bananas Foster. It’s not just for breakfast though; the dish is served all hours, and you can even order it at the bar. All told, the restaurant goes through 35,000lbs of bananas a year. Back in the day, servers would free-pour the rum, often very freely, thinking, as Ralph Brennan puts it, “The bigger the show, the better for me.” Which is an absolutely understandable impulse! But also a dangerous one. Brennan says there have been plenty of stories over the years of fur coats scorched, and one 1970s fire was reputed to have been caused by a disastrous meeting between some flames and an A/C’s return-air vent. Nowadays, servers use a jigger to pour enough rum for a show, but not enough for armageddon. There’s also steak Diane and crepes Fitzgerald, named long ago for still thriving local ad firm Beuerman Miller Fitzgerald, which, as NOLA.com describes it, was once the Crescent City’s version of Sterling Cooper Draper Pryce (they worked with a small condiment company called Tabasco, once created flavored ink for a sherbet ad, and drank tons of martinis). 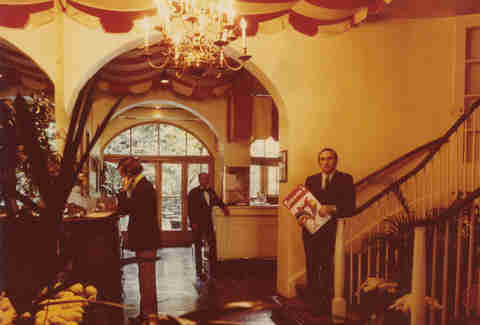 Among modern celebs who’ve enjoyed bananas Foster at Brennan’s: Kim Kardashian, Katy Perry, and Caitlyn Jenner.